Package Includes - Urban Farmer Weekly 7 Day Programmable Dual Outlet Digital Timer / Dimensions: 3.25" x 2.75" x 3.25"
AUTOMATE YOUR GROW LIGHTS: Grow anywhere and grow smart with the convenience of the Urban Farmer Programmable Weekly and Daily Digital Timer for hydroponics grow light system kits. Take charge and tailor your environment for greener grows with our controller designed to handle various growing light fixtures. SIMPLE TO SET UP: Easy and straightforward - Program, plug and play. The LED digital display allows you to effortlessly choose and select your desired settings. DAILY TIMER OPTIONS: Timer On/Off Mode allows you to set up a daily timer. 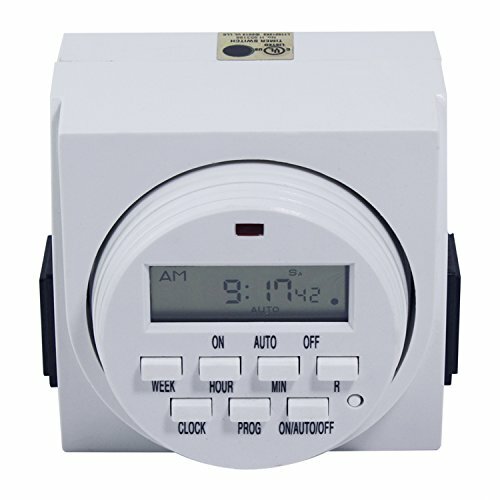 Timer Program mode allows you to set the hour, minute and day of the week you want the timer to turn on and off - Up to 8 options! 7-DAY PROGRAMMABLE TIMER: Choose what days of the week you want your grow lights to switch on and off. This mode allows you to schedule the timer to turn on and off only on certain days of the week. Provide your grows with a consistent lighting schedule, as well as reduce your energy cost. Choose from a variety of options such as daily, weekdays only, weekends only, every other day, or specific combinations of days - Up to 8 options! SPACE-SAVING AND RELIABLE SOLUTION: Slim and compact design with grounded three-prong plug connects directly to your wall. Use it in your grow tent, greenhouse, or any indoor garden growing environment. For indoors use only. Includes a battery backup feature to maintain your programmed schedule even during a power outage. DUAL OUTLET FEATURE: Features two side outlets, giving you simultaneous control for any two grow light equipment you plug in.